I have noticed that there are no current digital scrapbooking threads! There are some very old threads that have been dormant for years. Every once in a while someone goes to one of the threads and types a note, not realizing, those threads have long been inactive. I would love to see an active group chatting about digital, sharing tips, answering questions for each other and having fun. My name is Henri. I started seriously paper/trimmer scrapbooking in 2006 (although I did a primitive style of scrapbooking back in the 60's). I still paper/trimmer scrap some but my real love is digital scrapbooking! I started doing digital because my husband is an avid traveler - wants to run around constantly seeing the world and I go where he goes. 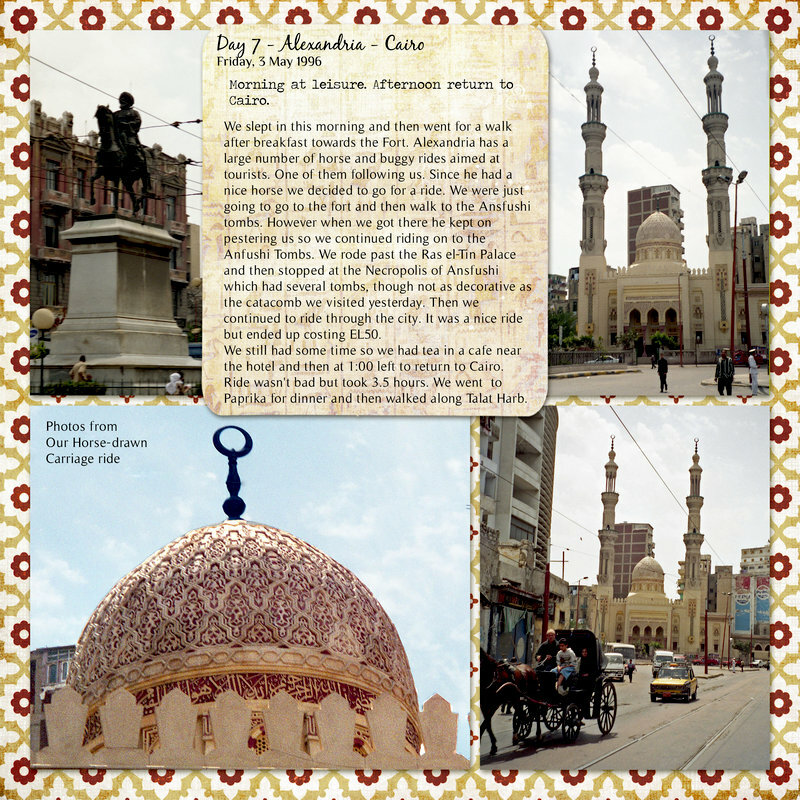 I scrap our travel into digital pages and then download them for printing in hardback books. They actually have titles and volume numbers with a list of the countries in each book printed on the spine. I have a very basic understanding of some of the features in Photoshop and use it quite a bit but the things I know how to do in photoshop are very limited. Mostly I make pngs and change colors in papers and on elements. I have an overwhelming collecting of paper and diecuts and I'm in the process of scanning it all into my computer to use on my digital layouts. I use My Memories for my digital pages. I downloaded MM7, the newest version but couldn't work with the black background and went back to MM6. When I talked to their tech support he said they were trying to get a function put into the next version to allow people to choose whether they want the background to be black or white. Anyway, if you are interested in being part of a new group to talk about digital scrapbooking, share your digital pages and maybe make a few new friends along the way - Please take a minute and introduce yourself. All I ask is that you be willing to post your digital layouts and comments on the digital layouts left here by others so we can for a support group of sorts. As I mentioned on another thread I have not delved into this yet but very curious. One of the most basic questions I have is this....I have Adobe Creative cloud with all the programs. If I bought one of the digital kits (papers and embellishments) I see would I import it directly to Photoshop or do I need a main program that holds all the different kits, then import to photoshop? Most of the digital kits I've seen download into a jpg format for papers and png for embellishments. I have mine all in a file called digital scrapbooking. 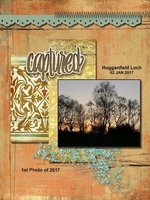 Becky Higgins has beautiful pl templates which I use for photos layouts with a lot of photos and those come in PS format. I don't think they download directly into PS but that is the format. I don't have anything stored in photoshop - I'm just not that advanced with photoshop. I tag EVERYTHING with Photo Gallery but other programs will do that too. Then I can go into Photo Gallery search and type in "background papers blue" and every paper I have with blue will pop up. Or I can type in "Captain's Wheel or Captains Anchor" and every paper or png with a Captain's Wheel or Captains Anchor will show up. Or I can just type in background paper and get almost 2,000 pieces of patterned and solid paper. If I type in background paper no theme it weeds out Christmas and other holidays, different places, nautical stuff, birthday background paper and all that. Takes the search down to about 1,300 papers. I've ordered a lot of paper and kits from scrapbook.com and those are standard downloads and you would have to put them into photoshop yourself I think. They are jpg and png files. I have a file called "Next to scrap" which has the pictures for the next layouts, scans of anything I want to use and I copy/paste papers and embellies I might want to use so its all in one file. Then I can keep adding things to that one file if I want to add flowers or other elements. Thanks for all the information. I think I am still not processing this right. If I understand your response there isn't a standard "scrapbooking" program that everything gets downloaded? If you bought a digital kit, where it would import would depend on where you bought it. There are good scrapbook programs out there and if you buy their stuff, it goes to their program. If you buy it somewhere else, it would go to a file you set up. I use My Memories and everything purchased from their site can be directly downloaded into the My Memories program. In fact when you purchase items, you have a choice of whether you want it downloaded into the My Memories program or into a general file on your computer - or both. Its no extra charge to download it both ways so that is what I do. Then I can work on the embellishments in photoshop to change colors and things - they are just png files. If I buy digital embellies and papers from scrapbook.com, or anywhere else, they are not downloaded directly into My Memories or Photoshop. You will have to set up a file to accept them and then put them in My Memories or Photoshop. That doesn't bother me because I keep a master digital file with everything. If you order from Becky Higgins they come in PS format but I convert them to pngs and use them in My Memories. Those don't automatically go into My Memories or Photoshop either. Nothing will go directly into the My Memories files except the things purchased from their site but that doesn't bother me at all. I don't know if anything can be downloaded in a way that it would go directly into Photoshop library, but I don't know how that would be done. But if you are looking for a digital program that has a library and holds things you download, My Memories is good. I've heard I can take my own jpg and png files and also put them in My Memories library but I've never tried to do that because I mostly work out of my own files. I hope this all makes sense. My Memories has a library and will automatically download things into their library if you purchase it from them. If you purchase it somewhere else, you can still add it to the My Memories library, although I've never done it. If you purchase things through other sites, such as scrapbook.com, you have to move it to My Memories yourself. I don't know if anything can be directly downloaded into Photoshop. I just use it for light stuff - wish I was more proficient in it! I have a scrapbook scanner and I am scanning my entire stash, including diecuts and embellishments. Then I make the diecuts into pngs and filing them in my digital storage files. If I want to, I can store them in My Memories files but I've never done that. I know there are other programs besides MM but that is the one I think is best. Tammy (Ladybling), who does beautiful digital layouts (she's my mentor kind of) uses My Memories. As far as standard scrapbook programs - I would say that is one of the most standard. So for that, you can buy from their site and it automatically goes into their software or you can add your own things you scanned or bought somewhere else to the MM library. Are you a Photoshop user? I don't know why, but I thought that you were - I know you are a lot more computer literate than I am. MM is like a dummied down Photoshop that even I can do - learned it in a couple hours without using the tutorial. The tutorial is on-line and I was on a ship with no internet. Its that simple. You completely answered my question. I love your answers,they are so thorough. You cover things as I was thinking them, awesome answers. Thank you so much for taking the time to write such a comprehensive answer. Glad I could help - if you decide to take a stab at Digital, let me know. If you are comfortable with Photoshop, you would probably love the Jessica Sprague tutorials - would have you up and running in no time. I subscribed to them, but with no basic knowledge of photoshop, they were over my head. After using My Memories the past year, I now understand a lot more of what the Jessica Sprague lessons were trying to teach me and I may go back and take the classes again. I don't even know how to be added to this group so that I can see future posts? I am currently a paper scrapbooker, but when my kids are grown and leave and I start travelling much more, then I would like to convert to digital, so I don't get "overrun" with scrapbooks. Do I understand correctly that you scanned all your non digital albums and made them into digital albums? I love your pages Henri Jean. Thank you so much for your kind compliment on my pages! I scrap very simply. My focus is the pictures and to me, just as important is the story. I know all the journaling keeps it from being quite so pretty, but it makes it more interesting when I go back and look at them. So many details that I had forgotten make me say, "Oh, yeah - I remember that!" My kids both read the stories that go with the pictures - I think it means more to them with the explanations, both historically and the accounting of what we actually did and felt. I also like to make important pictures BIG! The best way to be sure you see future posts (that I know of) is to go the bottom of this page where it says favorites and then put it in favorites. I have an icon on my desktop that says "Scrapbook.com Faves" and that opens up the menu with my favorite places on scrapbook.com. If they have new additions since I was there last, it will have the same coding for the color of the files as all of scrapbook.com so you can see if something is new. I check that before I go to the main scrapbook.com page. That has been a really good system for me. You said you wanted to start digital when your kids are grown - is that soon or way down the road? They grow way too fast. I got so overrun with scrapbooks. I was drowning in them. Every time I started a new book I knew my bookcases were overfilled already. Finally I was just stacking them in a stack on an end table because I ran out of shelf space! I did scan all my non digital albums. I found a company in Florida who did it for $1.00 a page. 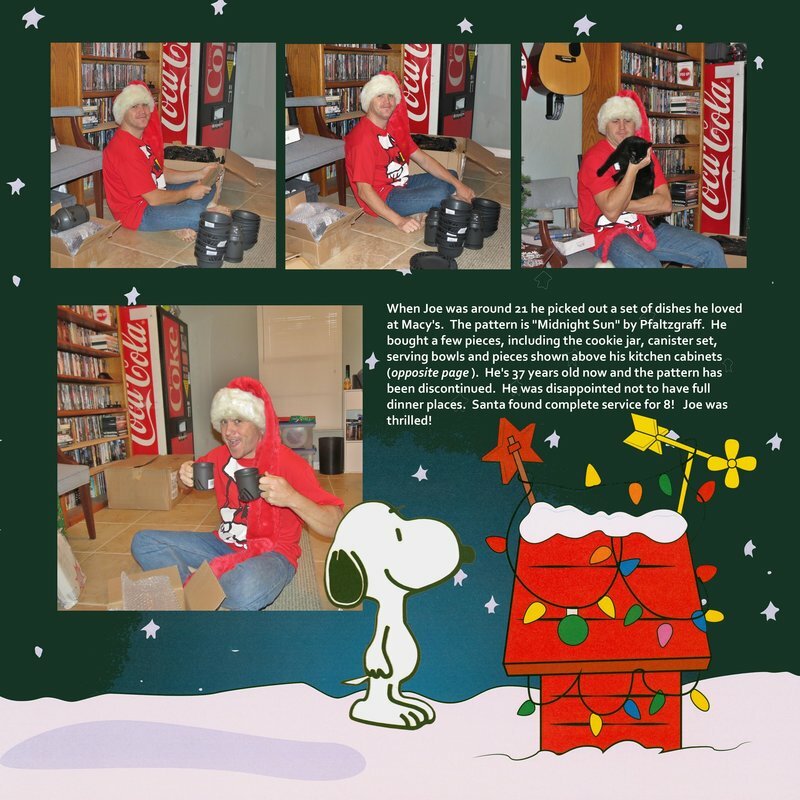 Then this past year for Christmas my son and husband gave me a digital scanner (they are about $500 and on those rare instances when I still do a paper page, I scan it and merge it right into my printed books. I'm also scanned all my paper and nicer diecuts. If you look at the Norway pages I'm posting, you will notice one Norway diecut (Says Norway and has a Viking ship) that I scanned from my stash. I've used it over and over. I also use papers over and over digitally. I also recolor the die cuts sometimes - I just posted a birthday card someone sent me and I re-colored the pink letters on the "Happy Birthday" die cut to match the main color in the birthday cards. So easy! I have a small portable scanner - not a whole lot longer than a ruler but a little bit bulkier. It tucks nicely into my carry-on suitcase so its always with me. I am always scanning things on ships and in hotels - especially things that I cannot keep. When we are in other countries, I scan the money. One time we were on a tour bus and our guide had a lot of different currency amounts from Burma and let me scan it all on the bus! That was really nice! We are overboard on the travel so I have to scrap them digitally or they would never be done. Today I'm trying to finish up our last trip to Hawaii (last year). Still have one more cruise from last year to finish scrapping (almost done) and 2 short cruises from this year. In September we will be leaving for over 2 months - most of it on ships and I will do as much scrapping as I can on sea days. Plus, my husband likes to find a chess game after dinner, usually in the library and I can scrap and scan in our cabin and sometimes I work on my pages at the end of the table where they are playing chess. My husband likes me to do that. You may want to download the program and play with it. Plus its never too soon to start collecting embellishments and papers so when you start to do digital, you have a library of things to use. That makes it nice. Hi Henri - didn't know you started this group page - how lovely. I like you, use My Memories (I used to use SU MDS and this is the same thing essentially). I too have a Photoshop program and have NO idea how to use it. Don't feel bad Tammy. I took private instruction - very expensive and am still pretty clueless. At first when I was making png file (transparencies) they were a mess and I didn't get the smudges. Now I'm pretty good with that part of photoshop and can do a few simple things but as far as using photoshop to do pages or- not a clue. Its way over my head except for simple things I do over and over. I hope more people find their way over here. There are so many on the boards who do such beautiful pages! I may put another notice directing people here in the main section. saw your reminder post - good one! Thanks - I'm hoping more will wander over here. I know there are a lot of digital scrappers on the boards. Good Morning...I have been playing with the digital Scrapbooking for the past 2 yrs and love it!! 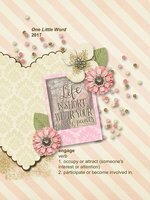 I use the Memory Mixer program and that helps..I also have photoshop but have not been able to learn it to well without the help form my dh who is consumed by his job..Hopefully things will calm down and he can help...In the meantime I am doing "Project Life" pocket pages and love it! !..Looking forward to seeing more post!!.. I have the Becky Higgins PL pages on digital. Let me know if you want to play with that. I converted it from PS to a png or transparency and am able to use it on My Memories so you can probably use it on Memory MIxer. You have to set the pictures on top of the holes which is easy enough, and then when the pictures are placed, just move the transparency forwarded. Or you can send the photos back individually but seems to work better when I bring the transparency forward. I will admit that it was tricky doing the layering and then the PL template but it worked. Was stubborn at time because it is made for photoshop. But I converted it to png so if you want to try it, drop me a pm with your email address and I'll send you the 6 or 7 that I have in png form. The transparency matting is white but with My Memories there is a recolor feature and its probably in your program too. The first time it made it pale pink and then a bit darker. It rook 3 or 4, maybe 5 color changing applications to match it to the background paper I had selected as the bottom layer but it worked nicely. Edited by Henri Jean on 08-25-16 05:30 AM. Reason for edit: No reason given. hi Kyla - welcome - I don't use the photoshop versions of pocket pages but I use some pocket style templates sometimes. Often I just do photo boxes in that style though too. Good morning..I did stop in at Joann's this past Friday and found the Becky Higgins core kits 50% off plus another 20% total purchase so that was a good sale...I have been making my own 4x6 and 3x4 but it takes me to long to decide on what to use so I thought it would be easier if not faster for me to finish a page....I have 20 years worth of photo's to work with....Wishing all a productive week!!! Thank you for the info!! I will check it out:) Love your technique in your layouts!!! Hi - I may be a bit scarce for the next week. Will check in as often as I can. We are going to visit my mom in Alabama and that is about 100 miles from the gulf coast where this tropical depression may visit if it turns into a hurricane. I don't know if we will try to weather it out with her or head home before it becomes a problem. We are just gong to play it by ear. 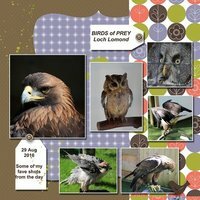 I am also a digital scrapbooker and noticed that there was not much about digital scrapbooking aside from the gallery that had such a section. 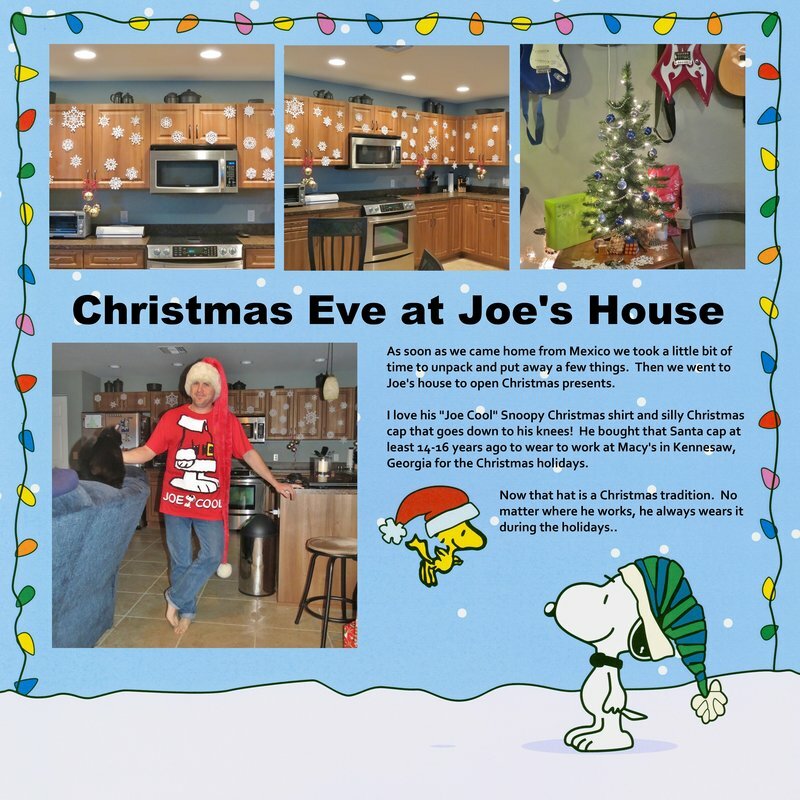 I am also a "designer" (if you can call it like that) and an instructor for digital scrapbooking on my own site, however, i am specializing in using Paintshop Pro as program. I was also looking for class in DIGITAL scrapbooking but found nothing on this site. Too bad! I have no idea if i can mention and link to my sites. If i can, i might edit my post. If not, well, it is ok. If i can help any new digital scrapbookers who might want to use Paintshop Pro instead of Photoshop or MyMemories, i would be glad to help out. Just ping me! Scrapbook.com has a rule that we cannot link any sites that sell things. So if supplies or digital elements and things are sold, it cannot be linked, since they sell digital diecuts. papers and elements. I don't know how it would be for just teaching or classes. Will have to find out. I didn't know you could do pages with Paintshop Pro. I do use regular paintshop a lot to get jpgs ready to turn into pngs in Photoshop, but that is all I've done with it. Jessica Sprague has didigtal classes - they are excellent but over my skill level. I understand not competing with the site, however, what i sell in my store is nothing like what they have here. I don't sell kits, or jpg or png elements. I sell scripts (that are kind of similar to actions in Photoshop, but more powerful) and i sell picture tubes that let you create long elements simply by drawing them. It looks okay to me. I don't see it as any kind of conflict. Joanie and the gang at scrapbook.com will let us know if there is an issue so I think you could post the link. I love the link with the ropes - very awesome. I don't know how to use the paint pro, but would be very cool to be able to do that! I can see awesome pages made with that! Well, if i have an opportunity to explain what can be done using Paintshop Pro, I will take it! Any question about using Paintshop Pro? Just ask!! Oh my gosh - I took a quick look at these links and they are amazing! WOW! We are at my mom's and there is no internet - I'm at her place of business for a few minutes so I'm able to check things quickly and post a few layouts. As soon as we get home we are heading overseas for 2 1/2 months and won't be home until after Thanksgiving so it will be then before I can really go through the tutorials and figure things out. We don't use the internet on the ships, although I use my scanner and make digital pages. We save internet for we are in ports and sometimes we literally have 5 minutes to check our email. If I get a chance to delve into these links a little more before we head overseas, I will, but if not, I really want to watch the tutorials and learn how to do this. Would love to buy some of these things too but have to learn how to use them. Would I have to purchase paint shop pro to be able to use them? Yes, you would need to get Paintshop Pro to use those tools i make. However, you can get a 30 day trial version which is 100% functional, OR if you want to grab a copy, the latest version just was released 2 weeks ago and there is a special offer until August 31st. If you want to take advantage of that, send me a message and i'll give you a link to that special. Edited by Cassel on 08-30-16 04:00 PM. Reason for edit: No reason given. I do want to check it out - but need a little time. We just got home from my mom's house an hour ago where we spent the last week. We are going to pack and then we are out the door again. We are looking at several flights to Europe and will head out next week for 2 1/2 months. Won't be home until after Thanksgiving. We have to get to Barcelona where we have 4 cruises lined up. One from Barcelona to Athens, one from Athens, around the Greek Islands and back to Athens, the third one from Athens to Rome and the fourth from Rome to ft. Lauderdale. It will be after that before I can take on anything new! Then in January 23 take off on a 71 day cruise (I think, may be only 68 days - I'm not sure) around South America and by Antarctica and into the Amazon. But it will be December until I can play with any new computer programs. I will check it out when we get back but between now and going overseas, its going to be difficult for me to come up for air - so much to do. I really loved what you did and want to investigate it further, just have to wait until this next vacation is over. and now I need to go back to bed even though I just finished my morning coffee after reading that! LOL I love you guys! And I am so glad you are safe and sound -hurricanes always worry me for you! And you should have plenty of photos to play with after those trips! I am not going anywhere so everything will still be there when you come back. I am married to a man who loves to travel so that is what we mostly do! Enjoying retirement. Fortunately we didn't get much hurricane activity here - crossed Florida north of us. I grew up in Miami with some of the worst of the hurricanes and this didn't pack the oomph of the ones of my childhood. We drove on I-10 where it crossed over and couldn't even identify the path. They are getting it so much worse on the East Coast. They are getting really pounded. Joe said we had a few sticks and twigs in the yard but that was it. I don't think the East coast is getting off dearly as easy, they are seeing some real damage. You are right about the photos - every night on the ship I organize and label the day's photos while Bill finds a chess game. Sometimes I take my computer to the library where he plays chess and watch him play while I work on my pictures. I also take a portable scanner on the ship and scan momentos and post cards from ports and pictures that we bought and are not digital. 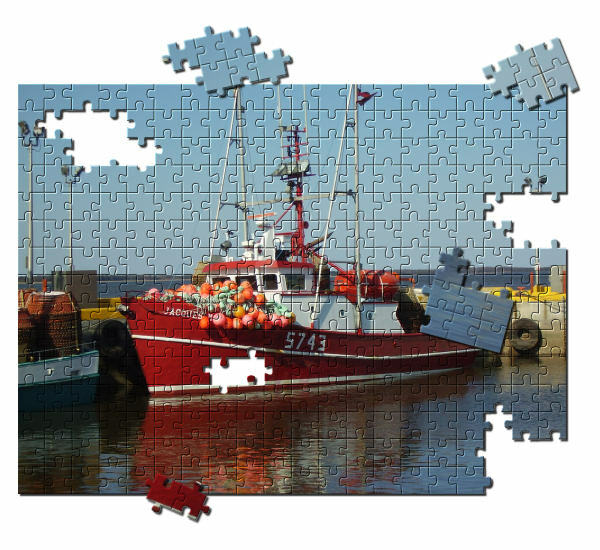 Get a lot of scrapping done on sea days and at night too. Tammy - these 4 cruises are going to be on the Prinsendam. Its the ship that you visited - our favorite ships are the Prinsendam and the Amsterdam. I can definitely see why digital scrapbooking interests you. Could you imagine trying to do traditional paper scrapbooking while travelling?? Impossible! 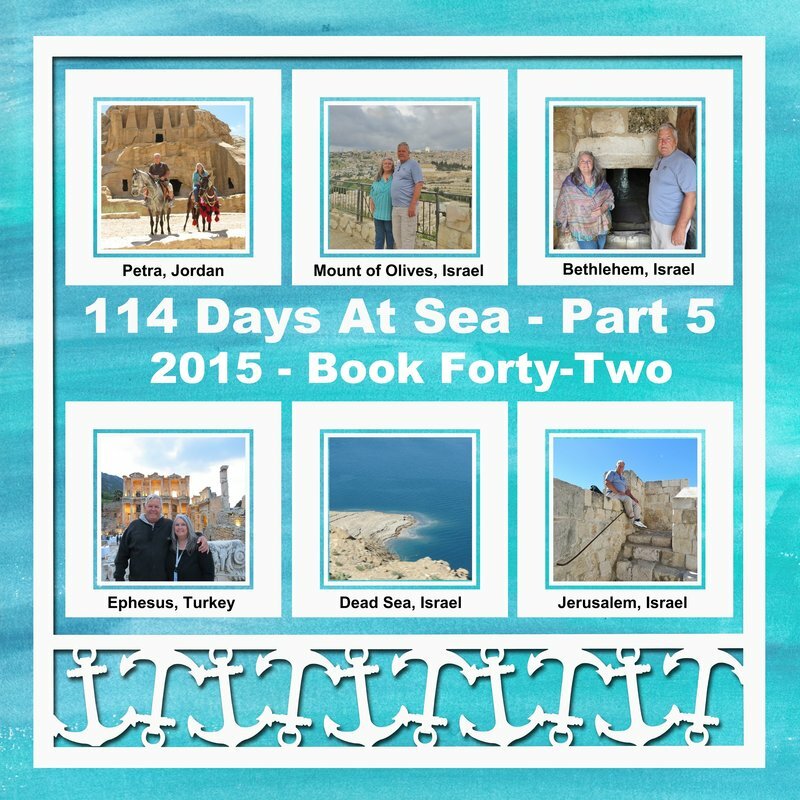 We've taken 2 world cruises for 4 months each. We were home for 2 weeks and so I had not scratched the surface of scrapping that trip. Then within 2 weeks we left for England (less than 24 hours after deciding to go). 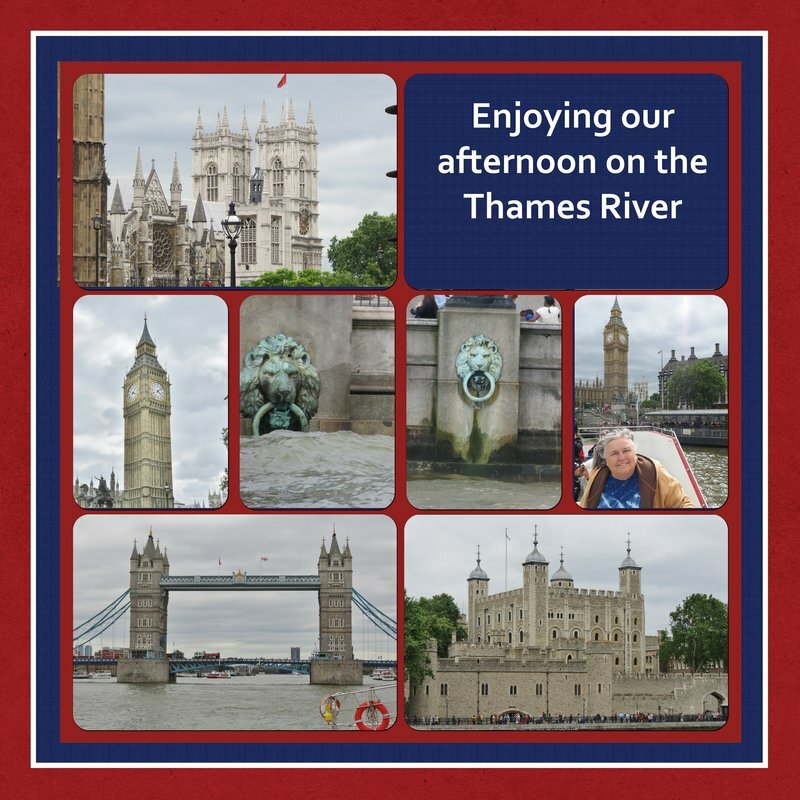 From there we got on a ferry to Holland, then a cruise around Norway into the polar ice cap, another cruise around on the same ship around Ireland and more of England, another cruise on the same ship to Iceland and Greenland and a lot of other places. Then we ended up in Boston and spent time there, then rented a car and went home. We were on ships 7 months that year and traveling nearly 10 months! 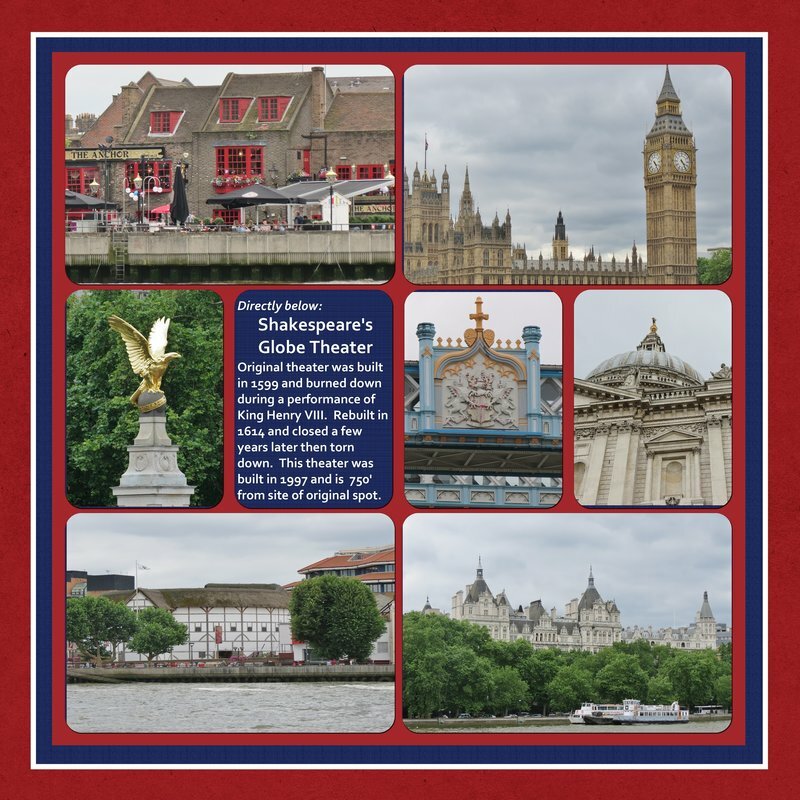 The next year (2015) when we got ready to do the 4 month world cruise, I downloaded my memories and taught myself to do that on the ship and kept up with the 2015 cruise - it was almost complete when I got home except for the last few ports. I have two 8 day cruises to scrap from 2016 and some family stuff, but then I'm caught up! Hopefully Bill will find some good chess buddies on the next cruises and I will get a lot of scrapping time in at night. No way I could take scrap supplies when I travel. Just not practical. I actually digi scrap on the planes! haha caught up - there will always be something to scrap my dear friend! You are so right Tammy. I got 7 pages done last night - only one more page and book 44 is done - 83 pages! But if I can just catch it up to the current stuff.... that is my goal. Taking my computer and scanner on next trip so I can try to keep caught up - for the most part anyway. I posted a few layouts i did, and some of them are from the actual classes I am teaching in the Campus. Thanks - will go over there and look at them. We are leaving for Charleston in the morning and then overseas so this is a packing day but had to take a break! Hi Henri, I found this thread so I thought I would join in. Now that I've finished Egypt, I'm thinking of starting my Alaska album. I've put together my color palette now I just need to assemble my supplies. How awesome to see you here Deb! I was hoping you would find it. The thread has been slow getting off the ground, guess people aren't finding it very quickly. I'm in Norfolk right now, hoping for a flight to Spain - we have 4 cruises lined up out of Barcelona. Will be gone until just after Thanksgiving. if I want to save my layout I must do it in an album but I cannot find where it is when I search for it on my HD it is not in a jpeg format. Oh my goodness - I hate that you are having so much trouble with MM. You are right - MM and Photoshop files cannot be used interchangeable. Don't understand the problem with elements and papers - I literally have thousands of papers and elements in MM that I've downloaded. If I buy from there site, you have option of saving as jpg or into MM - I save it both ways which I love! Then I can touch up their things with Photoshop if I want. You can also take anything you get anywhere else if it is jpg or png and put it in the MM program. Actually though, I access papers and elements more often from my digital scrapbooking file in my computer. I organize everything there and put it in the flashbar and its easy to get to everything! Just love it. In MM - to save in jpg click on Save layout. Then go to export and it gives you a lot of ways to save it. Jpg is one of the options. Photoshop is amazing but I just don't have the computer expertise to do pages with it. I can do simple things, like making png transparencies but I can't make pages - have gone crazy trying to figure it out. But in MM - just click on export and jpg is an option. I understand about transparency png files - I make them in photoshop too, then use them in MM. I don't know if you can resize for web in MM or not - will have to check and see what the options are in export. Some day I want to really learn how to do photoshop well but right now, so much is over my head. The layering is so much simpler in MM. When I scrap I put my folder in the flashbar with my photos and elements and another file called, "Next to scrap" which is things I know I want to use for the page I'm working on and even the next couple pages. Then when I am in MM - the things in that file are always in the selection bar in MM and I don't have to run around everywhere looking for anything. I put the papers and embellies and things I want to use in the "Next to Scrap FIle" which is in my flashbar and so they also show up on the things in MM - so simple. I downloaded Photo Gallery so that is a big help too. I keep it on the flashbar when I scrap and when I open it, there are over 2,000 papers to choose from because I tagged it all - even papers that were in kits. And I keep a file called "Trip Journaling" open too where I journal every day we are travelling so I can just copy/paste into MM pages. If you check MM again and go to Export across the top - you will find the option to save as jpg - you just have to tell them which file you want it in. And possible the one to save to web, I'm not sure about that but possibly. Wish I were there with you to sit down and show you some of the MM features and also learn about Photoshop from you - since I would love to be more versatile with photoshop! I just checked - to import to jpg - go to the icon with the letter "E" on it - the icon is light green on mine. Its on the bar across the top of the screen. The "E" is for export. Then you can save to the format you want (PSD is not an option though). Ayla, I know MM does not have the features that Photoshop does but I just find that tedious so far. I want to scrap quickly and it does what I need it to do for my pages. But I had been using the SU version for a couple years. There are definitely things that frustrate me. I like photoshop because if you take the time to learn it has so many features to offer. Here's a card I made, I did the design in photoshop, printed it out, and then matted it and mounted it on a card. The music paper was actually a full sheet of paper, I just use the magic lasso feature to cut away the pieces I didn't want. I was in a hurry and made this in about 10 min. 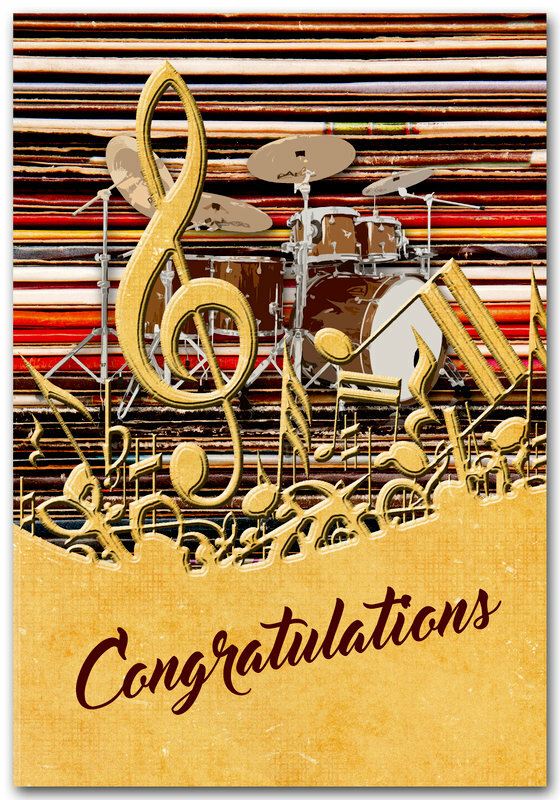 This card is amazing Deb! You are so good with Photoshop! I've tried and tried and spent hundreds of dollars in photoshop tutoring. Its just over my head. I keep playing with it and learning a few new things and one day I would like to be comfortable with it and have a good working knowledge of it but right now. I've tried to make pages in photoshop and I'm just not getting it. After an hour I close it out and go back to My Memories. Maybe someday. I'd love to learn it better because it is an awesome program but I can struggle for hours on Photoshop trying to make a page and just make a mess. Hi Deb! I haven't checked in here in a while. I have Photoshop Elements and I am promising myself to make time to play in 2017! 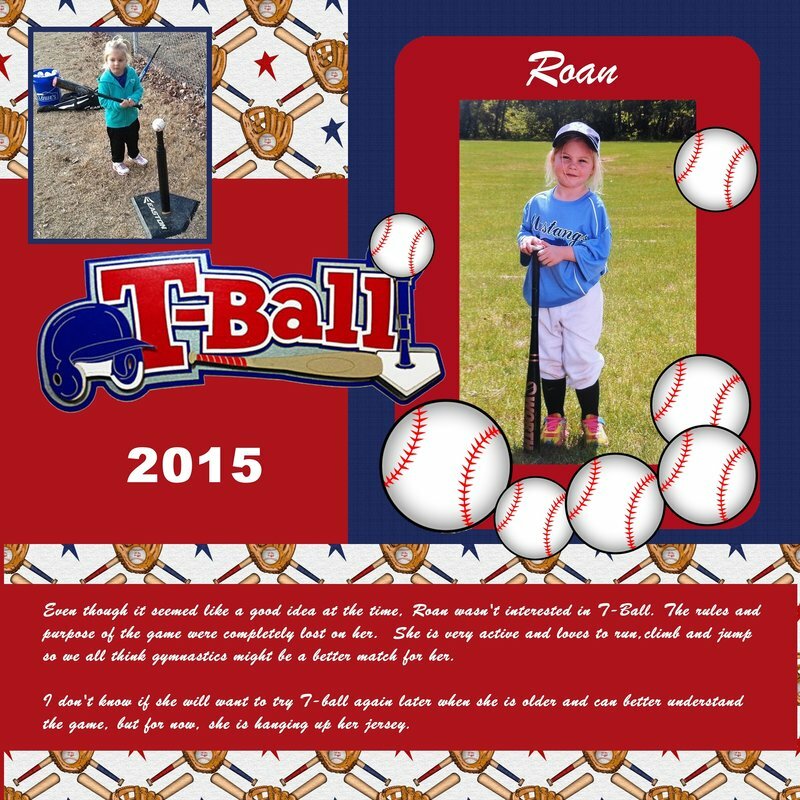 I have been amazed by your layouts where you blend the papers and photos together and you make your own backgrounds! There is a learning curb for photoshop elements, but it has so many features it is worth it. There are lots of youtube videos on making scrapbook pages. Plus tons of tutorials on just editing photos. I want to get more caught up. Then when I feel like I don't have 1,000 pages looking at me, I want to go back and go take the first Jessica Sprague tutorial again for Photoshop. I love all the things that can be done with Photoshop (although I've been thrilled with what I've learned with My Memories). I think My Memories will help me to grasp Photoshop better, especially the layering where I had so much trouble in Photoshop. That part is so easy in My Memories and so confusing for me in Photoshop. This looks like its going to be a mostly-digital scrapping year for me again with an end actually in sight. Once I catch up, then I want to perfect this whole digital thing and try to get a better grasp of Photoshop. Since 2016 is at end, I thought it would be nice if we went through our 2016 digital layouts and posted some of our favorites! I'll start, but please post some of your favorite digis. Then if anyone has questions about how it was done - we can discuss that openly in this forum so everyone can learn. Anyone game to post a few? I'll get some on in a few minutes. Deb (Autumngold) - really want you to jump in with some good examples, maybe with some showing how you did some of the backgrounds in your Egypt layouts! Those layouts are amazing! Thanks for the compliment, Henri. You do such a great job with the storytelling, I wish I could copy that. 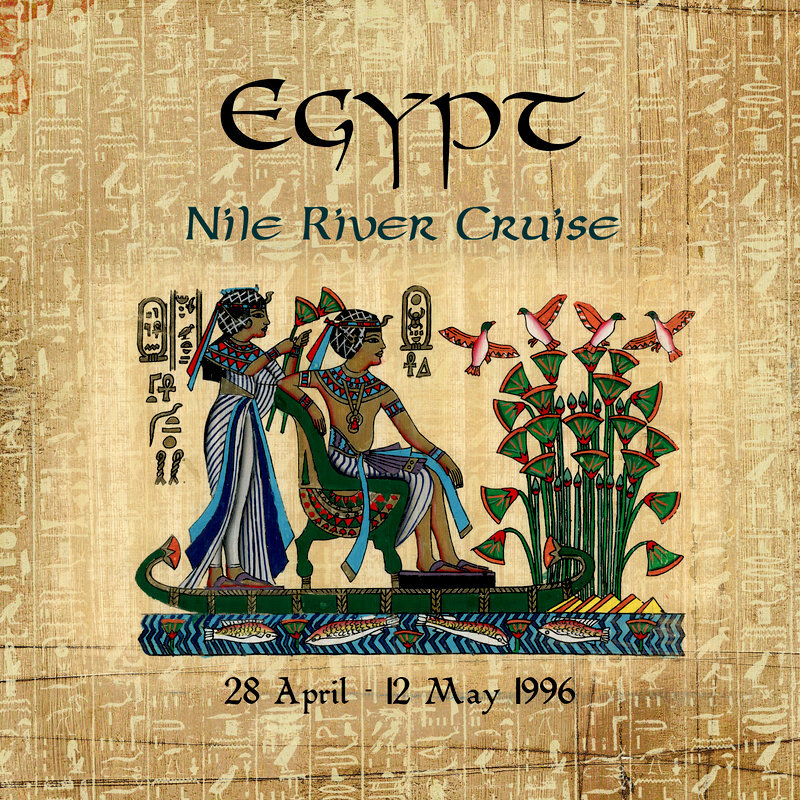 For my Egypt LOs I mosty used the Basic Grey Motifica I bought it from their site before it went defunct. I only had a few sheets left so I couldn't scan it myself. I also used Spice Market but that one I had the paper so I could scan it. Then using photoshop I was able to blend and recolor the paper. This one was made with Spice Market paper, but in the original the flowers were pink. To recolor the flowers I used the Magic Wand Tool with Contiguous unchecked. This tool works amazing when you have a color which stands out. This selected the flowers all over the paper. Then I used the Enhance->Adjust Color->Replace Color option. To make the hieroglyph paper, I used a similar technique with the Magic Wand Tool. I learned how to use this tool this past year and it is now one of my favs. I used to get ClubScrap kits back when I started scrapbooking and I bought lots of their Egypt kit when I thought I would paper scrap the album. Of course when I went to actually make the pages I found I wasn't fond of the papers anymore. But I did like the hieroglyph paper. I scanned it in and used the Magic Wand tool to select the hieroglyphs. Since there wasn't a lot of color difference between the hieroglyphs and the background paper I probably had to play with the tolerance. It still picked up some of the background which was ok. If you use the tool and click on another color you can add to the selection. Once I had the hieroglyphs selected I used the Edit->Copy and then changed to a piece of Basic Grey Motifica paper and used Edit->Paste. I probably played with the blending to get the look I was going for. Thank you for posting these Deb. I would love to be able to sit down with you for just one afternoon to learn some of your techniques. You are a world above my level in Photoshop. I use the magic wand tool, but mostly for making png files. I do that a lot. 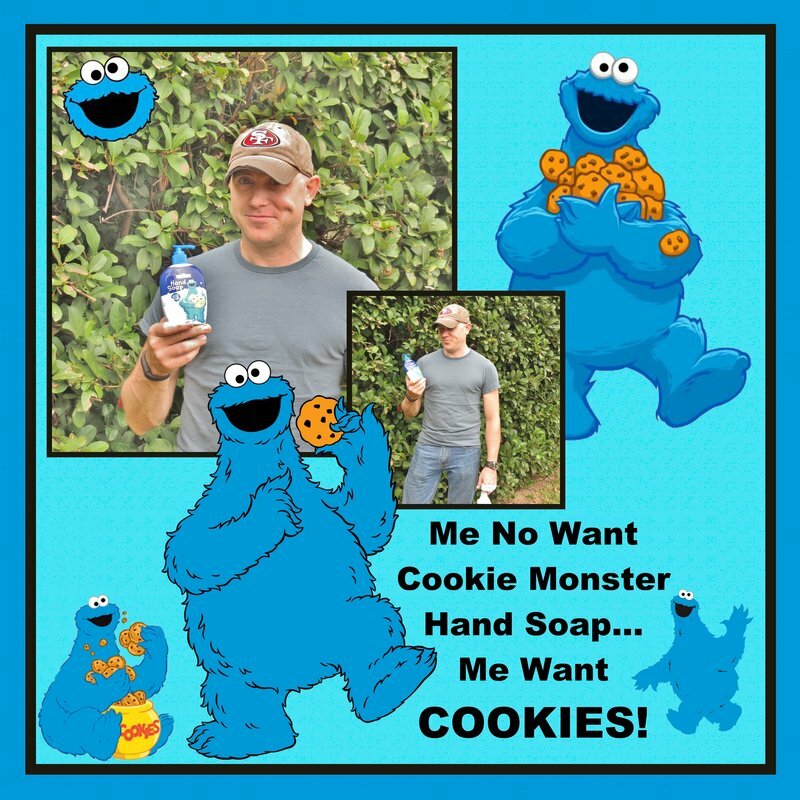 The cookie monsters in my layout above was grabbed from the internet and converted to png files but that is the really simple stuff. For coloring, I've always used the ink dropper and the paint bucket or brush. I have never used the magic wand for coloring but that is the next thing I will try. I really admire your photoshop work Deb - it is truly amazing. One of my goals is to really get a good grasp on what can be done with it. My son is very proficient - in fact he just ordered the monthly photoshop subscription and is taking advanced photoshop in college. I know I am a complete frustration to him when he tries to teach me. My biggest stumbling block in photoshop is the layering. I just can't put the whole layering thing in perspective in Photoshop and that is really holding me back. 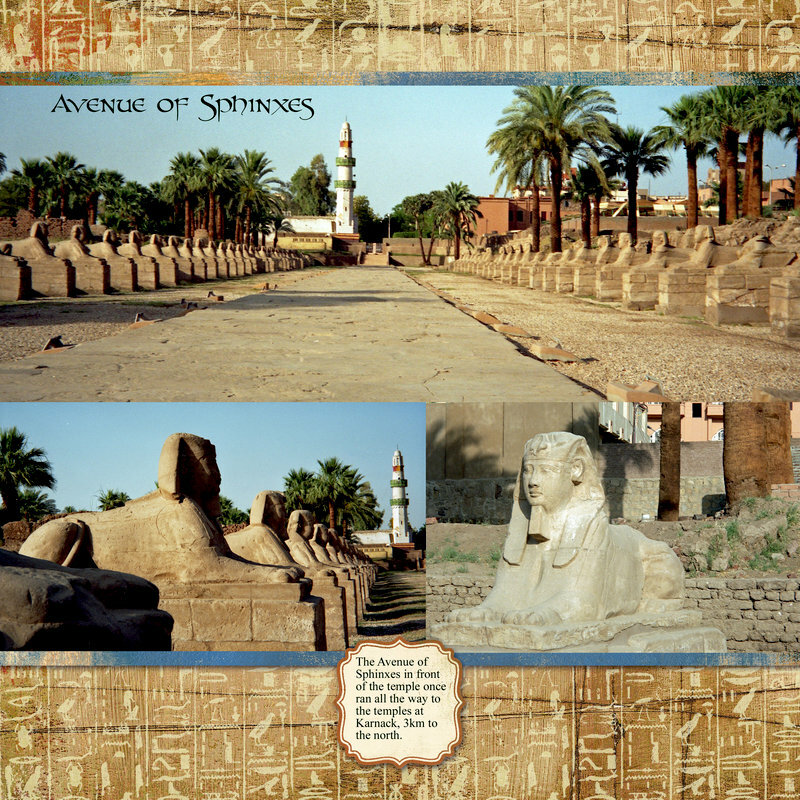 Thank you for posting these Egypt layouts Deb. No only are they done beautifully so artfully, they bring back very happy memories for me of our trips to Egypt in the past few days. It is one of my favorite places and I really hope the opportunity presents itself that we can go back to Egypt. I would say it is the most fascinating culture in the world to me - the culture of ancient Egypt. Thank you for starting this! I would like to join you, although I feel like a bit of a poser since I only did 2 digital LOs in 2016. A little about me: I started using Corel Photopaint from one of its earliest releases, so when I decided to try digital scrapping it was my natural starting point. My earliest efforts were done with it. In about 2009, I needed to upgrade my software, and it was a better deal to switch to PhotoShop at that time. Because I was homeschooling, it cost less to actually buy the suite with indesign and illustrator than photoshop by itself. So I made myself learn photoshop. Some of my LOs are done using both photoshop and photopaint, when I was struggling to learn. All my more recent digis are done using photoshop, and if there is a lot of journaling that I want to flow around photos or elements, I also use indesign. I feel like I've barely scratched the surface of photoshop, but I can usually get it to do what I want. I know there are lots of great tutorials out there for it, but I am not good with tutorials. I seem to need to actually do something for myself in order to learn it. And sometimes the harder something is to learn, the better understanding I get when I finally do learn. I am really looking forward to this group. We used to have a lot more digital scrappers here, and I miss the inspiration. Maybe that is why I've done so few recently. Hi Lynn - welcome! I am so new to digi scrapping. I've done a lot in volume but since I'm using My Memories, its almost cheating, since its made so simple. Tammy introduced me to My Memories and I really love it! But I want to do some of the more complex things that aren't offered in My Memories. That said, My Memories does do a small chip of what Photoshop will do but makes it much simpler. So I love the simplicity of My Memories but want the results of the more complicated features in Photoshop. I'm trying to do more on more in Photoshop but I'm really struggling to grasp it. When I see Deb's layouts, I know why I need to get a grip on it. You can just do anything in Photoshop! We cruise almost (not quite) exclusively on Holland America, only cruising on another line when there is a deal we cant' say no too. HAL has a computer guy, they call the techspert, on each ship and classes are taught daily. When we did the 4 month world cruise in 2015 and 2015 there were about 50 different computer and camera classes. He showed us Corel PhotoPaint but we didn't get into it a whole lot. I'm retired and have all day on the computer when we are home and when we are travelling, I have sea days on the computer and at night after dinner so I'm a very prolific digi scrapper. Not so much time for paper/trimmer pages although I still do a few. Enjoying digi more. Do you have your digi-layouts printed? I just discovered digi in 2015 but for 2 years I've been trying to catch up layouts. Mine are about 95% travel layouts so I like my trips to be scrapped completely. Lyn, welcome to the group! Maybe we can get more active in the New Year. I agree with you about the lack of digital scrappers here. Most of the digital LOs seem to be people pushing product. I'm always learning something new with photoshop. I have photoshop elements, but still that has so many features. When I watch tutorials, I try to follow along with similar materials and I find it helps absorb whatever technique I'm trying to learn. Edited by Ladybing Tammy on 01-02-17 06:05 AM. Reason for edit: No reason given. I have an old computer that was in the throes of death. Really didn't expect it to survive past Christmas about 3 years ago so Bill and Joe bought me a new computer that Christmas. Guest what - its coughing and wheezing but the old Windows 7 machine is still hanging in there - lots of hiccups and wheezing but basically, it words. Marginally, but that counts. Anyway, I watch u-tubes on that old one and then actually follow along and do what is being shown on my current computer, which is actually the 3rd computer since my old one got sick and seemed to be dying. In fact, when I digi scrap I sometimes put the pictures I want to scrap on flash and put them on the old computer and then I can see what pictures I'm using. Then I just go grab them off this computer. Very curious - how is everyone filing their digi paper and embellies in the computer? Even though My Memories downloads the ones from their site directly into the program, I also download them to my computer and file them in png or jpg format. Everything in jpg format is tagged in photo gallery dozens of tags. 12 x 12 papers all have a tag of "background paper" and then a tag of the theme - "Christmas, Easter, Cat, Food, Strawberries, Mykonos, Greece" - some have a long list of tags. If they are not themed paper, just dots, stripes, damask or whatever - then I tag them background paper - no theme. If I go to Photo Gallery and type in background paper no theme in a search it gives me over 2,000 choices. If I just put in background paper, I will get over 4,000 choices. I also tag all the colors in the no-theme paper, no matter how many. So if I type in "Background paper - no theme red" I will get several hundred red papers or papers with red in them, but not Christmas or themed. I have one file set up called "Next to Scrap" and its in my Quick Access on the left. Then I got to Photo Gallery, type in what I'm looking for, and copy paste and put it in "Next to Scrap" along with the group of pictures to scrap next. Makes it so easy - I'm not flying all over the computer looking for stuff. When I journal as I go, I have one long Word file. 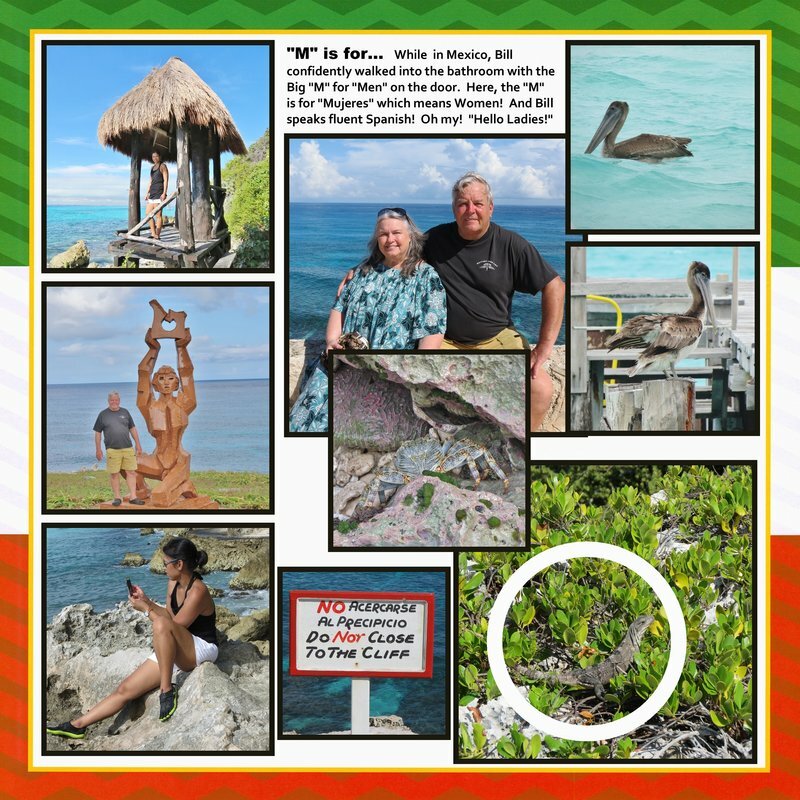 When I'm working on pages, I have my trip journal word file tab and my photo gallery tab opened in the flash bar along with file explorer so I can jump into photo gallery and grab more papers or into my trip journal file in word in the flash bar. I keep a piece of white paper in my "Next to scrap file" all the time and if I need a paper to match something in a patter or whatever, I copy/paste the white paper in the "next to scrap" (that way I still retain my white paper in the "next to scrap" file) and then open the picture or paper I want to match the color with in photoshop (also in my flash bar at the bottom). I use the dropper to match and then close that picture or paper. Then I click on my copied white paper in the "next to scrap" file and open it in photoshop and throw the paint bucket on it and I have a perfect match for a color in a dress or I if I want to use striped paper that doesn't match, I can change color of some of the stripes. Deb - I've never used the contiguous - does that change all the things or parts in a particular to the new color? If so, I wouldn't have to recolor each stripe I wanted changed from yellow to blue. I need to play with that. As you can tell, I am very, very beginner and have a lot to learn, but I am happy with the way I've organized. Unfortunately, png files will not hold tags in Photo Gallery and I don't think they will hold tags in any other program. I don't even know how to tag photos in Photo Gallery I am going to have to figure this out. I have so many files and often combine pieces out of different kits. I have been thinking about the best way to organize as I was working on this layout, today. I used stuff from 3 different digital kits and had to access them all a bit differently in My memories. Tammy - I set up a set of files in my computer under the main file of "Digital Scrapbooking". There it breaks off into Animals, Flowers, Food and at least 3 dozen other catagories. There is also one file called "digital kits". I leave the digital kits intact in their own files, but I also copy the elements and themed papers and put them in the files by that category. So my animal file has subfiles - household pets, aquarium, zoo, insects & Butterflies, and several other subcategories. So if I'm doing a layout on a cruise, if I go into my cruise file under digital scrapbooking, it has all the cruise 12 x 12 papers as well as things I've scanned and made into png files as well as cruise-related elements from digital kits so it takes me no time at all to just open the cruise file in digital. I've also got a file in digital called, "USA Travel (by State)" where all the states are listed with their own file folder and the things for each state is in there - papers, png files and now I even scan post cards and put them there because they can be used again as an embellishment sometimes. I also have a file - "USA Travel General" which is just general road trip stuff with no particular state indicated. Same with International travel - I have a file for each country with everything in them, lately I've even been putting currency scans in them. Some have maps I thought were good and now I often add postcards that I may want to use again. Then my international travel - General file folder has just basic travel stuff like little passports and a title that says, "Spending Euros". When I first started making pngs I didn't know many of the tricks to polish and clean them up but now they look a lot better. Photo Gallery is a free download from Microsoft and I love it. I use it for most of my photo editing too! Does great panaramas - I use it for all my panaramas. When you download it, it comes with 4 parts and automatically checks to download all 4. They are photo-movie editing, instant messaging in that program, an email part and something else. I learned in computer class to uncheck the instant messaging, email and the other part I didn't want so I just got the photo and movie editing part which is all I wanted. Did the same thing when I downloaded it on this computer - unchecked what I didn't want. But you have to watch to make sure you don't automatically download it. Between the photo gallery and being able to type in the search bar what I'm look for in my digital scrapbook file, or I can go into my "digital scrapbooking" file folder in file explorer (Pictures) and open any file. I know there is a way to put my entire digital scrapbooking file on the cloud and make a link that everyone here can access and copy what they want or take the entire folder. Actually, it is already there but I would make a separate file for anyone who wants it - I will look into it. There are at least 6,000 images in there. Will look into doing that. Some images are high-resolution very nicely done and some are lower resolution and aren't so great, but still, they can be used on a small scale. You just can't blow them up very big! Everything in it is already labeled and tagged in photo gallery but there are some pngs which were tagged but when you move a png file from one file folder to another, the tag does not go with it. Very frustrating! Henri, you might be sad to know that Photo Gallery will no longer be supported after January 10, 2017. Hi everyone! I just started digital scrapbooking in the summer when I decided to make two separate scrapbooks for my two male bosses. I purchased My Memories and absolutely love it but thinking about going to Photoshop soon. I made both books and My Memories did a wonderful job with the binding and everything. My bosses loved them. I also exported the pages into a DVD photobook with music background. Took some doing since Windows 10 Movie Maker stopped doing the conversions. Good thing I have other software. I actually still have tons of paper and other papercrafting stuff that I intend to sell at some point. But I still intend to do some things with the paper and my Cricut. I just love the digi stuff so much. And I love the thinner, flatter books instead of the bulky ones. Oh no! No more Photo Gallery? I sure hope Microsoft will add something just as good to take its place! I had not heard that and am very upset at the news - disappointed to say the least but hopefully there will be something else in its place! Michele - I'm in the process of scanning all my paper and using it in digi layouts. I have about 3,000 sheets of patterned paper but there are a lot of duplicates. Some patterns I literally have a collection of! I have about 15 regular paper and trimmer scrapbooks on my bookshelves and 44 printed (Shutterfly) digi scrapbooks. The 44 page books are approx. 100 pages each and the 15 regular are 20-40 pages each. And, the 44 printed take of a fraction of the space of the 15 regular scrapbooks! Love everything about digital scrapbooking. I use picasa to organize all of my digital papers and elements. I keep kits together and then tag everything. So for example for the Alaska layouts, went through through and tag all the papers, etc. I want to use with "Alaska". Picasa actually embeds the tags in the file so they are there for any program. They also stay with the files so if you move a file from one folder to another, the tag stays with it. I usually tag all my papers with the color and if they belong to any type of theme. Picasa allows you to search using tags so if I type in "purple ribbon" I'll get everything I've tagged as both "purple" and "ribbon". For my photo books, I have a folder I've labeled with the year and the event, Alaska - 2016. I then put in my journaling for the cruise. I also create a shortcut to my templates folder because I use a lot of templates. I also create a shortcut to the folder with the photos for the album. Anything else I've scanned having to do with the cruise will go in that folder. I think I have you beat for images, Henri. I have 40,000 digital files, but I've been collecting a while. The amazing thing is most of my collection was free, I built it up from blog trains. Unfortunately the trains have mostly come to an end. Now I'm growing my collection by scanning my paper. I don't do anything to tag my photos other than organizing them into folders by date and labeling the folder with the event. When I first tried the organizer which came with photoshop it seem more organized around dates which is how I ended up with picasa. Unfortunately picasa is no longer supported so I don't know what I will use when I need to move to a new computer. I'll probably give photoshop organizer another try. Henri, unchecking contiguous will allow a color to be selected all over the image. You can also play with the tolerance to determine the amount of color variation you want picked up. I have a lot of friends who use Picassa and love it! I didn't know it was ending support also. Just learned Photo Gallery was ending today. At least my computer is only 6 months old and has a terabyte of memory so I'm okay for a while. When I took my computer classes on the ship we couldn't get internet on the ship (cost a fortune) to download Photo Gallery so the techspert who taught the classes had Photo Gallery on disk so we could load it without being online. Wonder if that would be possible for Picassa and Photo Gallery when getting new computers. I tried Picassa and to me it appeared it was making copies of all my photos and started downloading things on its own and that kind of scared me. Does it actually make another copy of every photo, and if so, what about storage space on the computer? That would eat right through the memory. Photo Gallery tags also stay with the photo when you move them or transfer from one computer to another, even when posted on line I think so I like that a lot. Don't know about compatibility with other tagging programs but I think it is still good. The only issue is png files. I haven't found a way to tag those where they hold when they are moved from folder to folder or computer to computer. But jpgs hold perfectly. Have been interested in trying Picassa again but not if they won't be supported much longer - doesn't make it worth it. Wonder why these two programs are doing that so soon? Maybe something else is coming out. I can only hope! You sound like your filing and organizing system is a lot like mine. I also have a digital file for each album - I name each of my albums too. But I also tag all photos. Then if I want just photos of my mother, I can just do a search in Photo Gallery for her name. I was looking for a particular photo of Hawaii recently and when I typed Hawaii in the search bar, over 1,000 photos I've taken in Hawaii over the years came up, sorted by date taken. I knew the approximate year and could just scroll down to it. I backed up my computer tonight and it said I had almost 67,000 files. I know I have about 4,500 digital jpg scrapbook papers, Don't know how many png files, just know I'm many laps behind you! I have tons of travel photos so that is a big chunk of my 67,000 files! I often go into images and type in what I'm looking for - I recently needed a chainsaw and before that I needed cartoon images of Cookie Monster. I can take those and turn them into nice pngs and color them the way I want. I have a file for each cruise in books I want to do - somewhat organized but definitely dated and in order and labelled as to what island or place. I work from those files. I copy/paste 10 or 20 of the photos at a time and put them in my "next to scrap file" with papers and png transparencies and whatever else I want for that group of photos. When I've used all of them that I'm going to use in Next To Scrap, then I go into the folder for that cruise and copy/past the next 10-20 pictures and bring them over to the Next to scrap file. Then it is always in the flash bar and I can always click on it and see what I'm working on. Right now it the Bonnie and Clyde car which I've researched but haven't edited yet. Project for tonight maybe. Thanks for the info on using contiguous - that is going to be a handy little trick that will save a lot of time. Seems every time I learn something new, I also see how much time I've been spending taking a lot of extra steps that weren't necessary! Henri, i did some research and i found that FastTone Viewer might be a good replacement and it can handle png files. Thank you! Do know if it copies all the photo files again or works on the ones that are already stored in their current file location? Going to go research FastTone right now! I used to use Picasa but I also thought it was keeping multiple sets of photos. I might have to try this FastTone. I did some checking on FastTone last night and it looks interesting. I'm going to kind of sit tight for a bit to see what Microsoft comes up with. Also need to get a message to my Holland America computer instructor who taught me Photoshop. He keeps up with me through Facebook instant messages. I want his opinion. t come up with something to replace it. I have my picasa set up so it doesn't make copies of files. But then I don't use it for editing, just organizing. I also just use it locally. Support for picasa has already ended, you can't even download it anymore. I looked at the FastStone site and it looks interesting. I like that it will tag PNGs - not familiar with XnView. Right now my Photo Gallery is working perfectly so I'll roll with that as long as I can. By then, maybe there will be a Microsoft replacement. Otherwise, I will have to look into something else. I have to tag my pictures and papers. Would love to be able to tag my transparencies too! I didn't know you could do that Deb. Will have to look at it. Armywife asked me a question and I really don't have a good answer. I have answers, but none of them seem to be the right answer as far as being easy. She purchased a set of letters and they are all on one page. I have a lot of letters sets I purchased that way too, but I've never used them. I tested and I found two very cumbersome way to use them. The first way is to throw the entire sheet of letters up in My Memories and then crop out each letter one at a time. Aside from being a pain in the neck, the letters do not end up being uniform in side and have to all be adjusted. Then there is the issue of spacing them nice and even. The other thing that worked, but again, not easily, was to crop individual letters in photoshop and then use them on pages but again, the letters were not uniform in size when I did it that way and were difficult to space evenly when I used them. There is a video illustrating how it works. That is very interesting. The video made it look pretty easy! I have a lot of sheets that I bought too and haven't used them - mostly ones with a blinggy effect. I don't have the access to PSP though - if I had it, looks like it would be the solution. I told her about this link so she can come over here and check it out. Will tell her about it too. The script will work even if you only have a trial version of PSP (which would be free). With 30 days, you have plenty of time to split all those alpha sheets you gathered over time. That is what I need to do. We are leaving on a cruise on Saturday and I don't want to waste part of a free trial while I can't use it so when I get home, this may be something to do! What is PSP - is it part of Photoshop? I have photoshop already. PSP is Paintshop Pro. It is from Corel. That is the program i use and teach. It is more powerful than most people think, and it is a one-time purchase (no subscription) so you can keep it for years if you want. I am so sorry - I know it is your son who is in the army! My brain was just out to lunch. It spends way too much time out to lunch! Cassel - are you completely making your pages with Paintshop Pro or just using it to make cool things? Does it overlap with some of the Photoshop functions? Sounds like I need to investigate this further! I never use letter elements because I think they're too much of a pain to use. If I want something special done with a title I'll add a bevel, shadow it, or group the layer with patterned paper. I have a large collection of fonts so I just stick with those. Yes, i do all my pages and projects with Paintshop Pro. I never used Photoshop to create anything. Paintshop Pro is comparable to Photoshop Element in price, but close to Photoshop in functions. I am not saying that PSP is better than Photoshop. In an ideal world, someone would have both to benefit from all the features of the two programs. WOW! Read the blog but it will be tomorrow before I can check the utubes. Bill is at his desk behind me and I don't play utubes while he is working on something else. I wait until he is outside working or not home then I catch up on utubes. Anxious to see all of this. So far - it is W-A-Y over my head but I would love to learn. And for those YouTube videos, you can watch them without sound too so you can "see" what it does. THANKS everyone for posting all this information. Helps us newbies to Digital. WOW Cassel - I love the puzzle effect. I'm going to have to look into all this when I get home but to be honest, I'm completely lost about how to use any of this or what to do with it to get all these nice effects. Wish there were classes here to teach this! Henri, i have such classes, and i also have videos on Youtube on how to install and use scripts, so when you are ready for it, just let me know and i'll guide you. You will see that it is very easy. And i am always there to guide anyone who wants to learn. Of course, the installation of the script would be on another video, but you can see how easy it is to USE that particular script. We are in a hotel in Vero Beach tonight but when we get home, I will check out all these tutorials. Thanks Cassel and Deb! 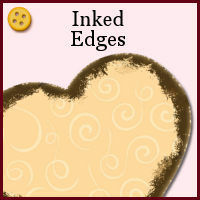 Anyone have any methods for creating "inked" edges with photoshop elements? I'm not happy with any of the methods I've tried. Not tried top lay with inking on Photoshop. However, if anyone can figure it out and make it look good Deb - it will be you! Ok, since new to the digi world, would like to know some of your favorite places to get kits, papers and embellishments? Everything is free and there is a lot!